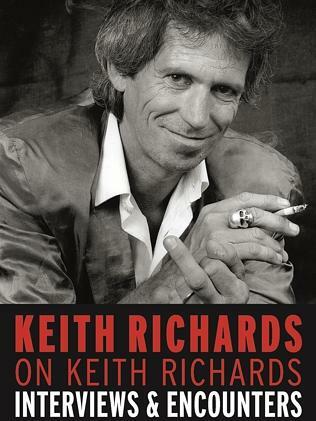 The front cover of Keith Richards on Keith Richards features a photograph of the great man taken circa 1990. In one of his gnarled hands a burnt-down cigarette smoulders perilously close to the knuckles, its silver fumes mingling seamlessly with the mushroom cloud of his hairdo. On the middle finger of the same hand reposes the skull ring he started wearing in the 1970s as a memento mori – his lone concession so far to the concept of death. The middle finger of his other hand is raised directly at the camera. But the veteran eyes twinkle, as if to assure you that he flips you off out of love.